The West Norwegian Fjords Geirangerfjord and Naeroyfjord are archetypical for fjord landscapes around the world. 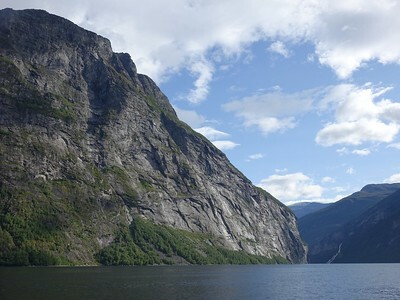 They are also among the world's longest and deepest fjords. They offer outstanding scenery, with crystalline rock walls that rise up to 1,400 metres from the sea. The two fjords are located in the southwest of Norway, 120km from another. The fjords are 1-2 km wide. Geirangerfjord is one of the two West Norwegian Fjords that have been inscribed on the World Heritage List because they are among the longest and deepest fjords in the world. They are also known for their beautiful and dramatic landscape with many glaciers, waterfalls and lakes. During my visit I based myself for two nights in the town of Geiranger. The town has a remote location: I spent over 2 hours driving from the nearest airport in Alesund, hitting less than 50km on average because of the many hairpin bends, the long and deep tunnels and an unavoidable ferry crossing. The approach to Geiranger via the Eagle road is epic though: you feel so tiny in your car amidst these surroundings. The term ‘dramatic landscape’ is overused in general, but fully fits this area which already is in the rather large core zone around the fjord itself. On my first morning in Geiranger I joined a 90 minute-boat tour. This is a very touristy affair and the trip only involves navigating Geirangerfjord until it meets the Sunnylvsfjord, and then it returns the same way. From the water level though the many waterfalls in this area can be seen well. The running commentary on the audio guide also directs one’s attention to the historic farms. These are somehow plastered to the very steep cliffs. A totally different experience than the sedate fjord cruise is the road trip up to Dalsnibba. More hairpin bends and narrow roads through a barren glacial landscape lead up to this viewpoint at 1,500m altitude. The Geirangerfjord lies 17km away but can still be seen – however the view during my visit wasn’t great because of the weather circumstances: it was so cold that I wished that I had brought gloves and a mix of rain and snow fell down from the sky. Most tour buses stop at a view point called Flysdalsjuvet, just above Geiranger, to let its passengers take panorama photos of the fjord. For me it proved to be the best spot as well. The next day I visited the Norsk Fjordsenter, which is the world heritage information center. It does warrant half an hour of your time as it explains the process of how the fjords came about very well (they were carved by glaciation during the Ice Ages and filled with sea water after the ice melted when the bottom reached below sea level ). It also exhibits life in the area in the late 19th and early 20th centuries. Most of the hiking trails in the area are very steep and eventually end up at a waterfall. I opted for different scenery: at the top of the hairpins via Eagle road there’s a parking lot called Korsmyra. You can do a couple of hikes from there that involve less climbing, as you are already at considerable altitude. I choose the medium level but short ‘S’-trail to Hesjedalshaugen. This proved to be well worth it: it’s a quiet trail that leads through the grounds of a sheep farm. They keep black sheep there – at first when I saw them from a distance I thought they were wild reindeer! The views are good here as well and I enjoyed the various plants in the swampy grounds. These fjords are by far Norway’s best and most quintessential WHS. Tourism has a long history here: already in 1858 a weekly steamship brought passengers to Geiranger. Last year they had 182 cruise arrivals. The town has only 246 permanent inhabitants – and sees a whopping 700,000 visitors a year. It’s not over-commercialized though: no bungee jumping and I read somewhere that it still has only 4 hotels. Its attractions are on the pricey side (12,5 EUR for the visitor center, 14 EUR for the toll road to Dalsnibba and 35 EUR for the fjord cruise) – but hey, this is Norway. Geirangerfjord is a classic destination and a bit old-fashioned as well; it reminded me of Halstatt and towns in the Swiss Alps. The Naeroyfjord features prominently on the Norway in a Nutshell route that is popular with tourists. Nearly 20 kilometers long and at points only 500 meters wide, it’s tough to imagine room for the massive ferry boat, but the expert captains maneuver in such small spaces. We followed the route and were pleased to discover this long, narrow Naeroyfjord by boat. Of all the natural features in the world, we loved the fjords. We absolutely recommend visiting the West Norwegian Fjords. I visited this WHS in May 2010. I trekked around the West Norwegian fjords and peeked down 600m high cliffs. However, the best way to enjoy the natural beauty of the fjords is by boat. By boat, I could gaze at the many cliffs, waterfalls, trees and birds around the fjords. An outstanding natural beauty! My journey through the Geiranger and Naeroy Fiords is as much a tribute to the road engineers and bus and train services that operate in the area. My journey started at Andalsnes railway station after having descended from Dombas on the Rauma line, itself a scenic wonder. Then commenced one of the scariest bus rides I have experienced, up the seemingly endless zig-zag highway over the Trollstigen. From the bottom I admired the cascading waterfalls, then from the top the panorama way below. After descending to the Nordaelsfjord the bus crossed by ferry to Eisdal and then climbed to the summit of the Eagle Highway. From here there was a fantastic view over Geirangerfjord (including two cruise ships). Then began the hair-raising descent to to the touristy town of Geiranger. Here I boarded a ferry for the voyage to Hellesylt at the other end of the fiord, where another bus awaited to take me through some lengthy tunnels to Stryn and Sogndal. After a side trip to the Urnes church I took a bus from Sogndal to Kaupanger where I boarded another ferry bound for Gudvangen, which after crossing the Sognefjord sailed the full length of the Naeroyfjord. This fiord is much narrower than the Geirangerfiord therby barring access to cruise ships. Besides the steepness of the sides there are more villages and waterfalls along this fiord too which make it more interesting. At Gudvangen I caught a bus through another tunnel to Flam and from there travelled by train via Myrdal to Bergen. All this sounds like a lot of travelling, but spread over four days with overnight stops in Andalsnes, Sogndal and Flam it was most enjoyable and rewarding. Norwegian fjord nature is very special and I agree that it is a must see. First time for me recently, 48 years old and living just 1000 km avay. Expensive to drive nowdays, and Norway is extremely expensive even if it has its own oil. Anyhow, with car you can drive on 1300 m high just about 10 km from sea level and I passed a cut in the snow which vas about 3m high (16 june 2008) at Strynfjell. 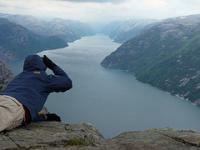 Visit Norwegian fjords at least once in a lifetime! Only managed to do the Naeroyfjord - GLORIOUS, go, go, go it can't fail to impress! We did the Norway in a Nutshell tour from Bergen, by train, boat and bus the cruise portion including Naeroyfjord which is stunning. Also on the trip was the Flam Railway which in my opinion should also be include in this WHS listing - which perhaps should be extended as West Norwegian Fijords and there environs. In April I visited Norway and since I didn't have a lot of time and most of the tourist sites were still closed, I did the Norway In A Nutshell Tour (to be booked at almost every trainstation and tourist office). You first take a regular train, and form there you take a special train (it has to descend into a steep valley) up to Flam where you take boat trip a along the Aurlandsfjord and into the Naeroyfjord which is truly beautiful: high fjords, very green water, high waterfalls, it was just perfect! You will have a busride and a trainride back, so it's a pretty long day, and a bit touristy, but it's a great way to see something of the fjords in a fast way. You can also take this trip from Bergen, so you can include Bryggen on your trip and see 2 UWHS in one day. In my opinion, of all the new sites inscribed in 2005, possibly only the West Norwegian Fjords are in the “Worth a Journey” category. The 2 fjords chosen – Geiranger and Naeroy really are among the very best scenic sights in Europe and indeed many people do, quite rightly, travel to them for an entire holiday. I say that having visited every European country and most of their scenic sights – but then Norway is one of our favourite destinations so perhaps we are biased! The 2 fjords are some distance away from each other and are each situated at the head of longer fjord systems – Sognefjord and Storfjord respectively. They are both characterised by being very “narrow” – but what else connects them for selection as a “pair” I do not know! 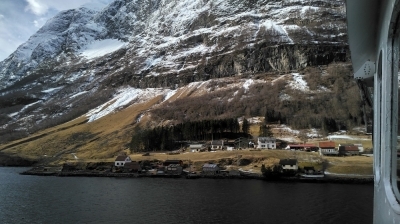 Naearoy is very fine with the pretty village of Gudvangen at its head and is actually the “narrower” of the 2 with the ferry at times almost seeming to touch the 1000 + metre cliffs on either side. My favourite however is Geiranger. Our preferred way to approach is by the magnificent 1 hour ferry journey from Hellesylt and then leaving by the Eagle road to Eidsdal. But Geiranger itself deserves to be explored from every route so go out south first towards Grotli and look at the views from there. Preferably even stay and do some walking. Just pray however that one of the enormous ocean going cruise ships which can reach this far up the deep fjords isn’t in port to spoil the peaceful atmosphere. And if only Norway would pass a law to outlaw all those stupid wooden statues of Trolls which disfigure the towns, villages, restaurants etc!! Hit by Tsunami: Nomination File "On several occasions in historical times, rock avalanches plunging deeply into the fjords have generated large tsunamis that have destroyed villages and killed people. The most recent catastrophic event was the Tafjord disaster in 1934, when about 3 million m3 of rock fell into the fjord and created a tsunami (huge wave) reaching a maximum height of 62 m (Figs. 9 and 10). After moving 8-10 km along the fjord it was reduced to a height of 10-15 m, swamped three villages and killed 41 people. The small community at Fj?r? was totally destroyed by the tsunami, and 17 people lost their lives." Glaciers: Nomination file :- Present glaciers Numerous e.g Geirangerfjord - Flydalsbreen, Skjerdingsdalsbreen and Hestebreen) N?r?yfjord - Fresvikbreen(1500 ha) and Syrdalsbreen. Late Pleistocene: The high mountain surface is a slightly undulating peneplain dissected by rivers, the courses of which were deepened, widened and scoured 20,000 years ago by the glaciers of the last Ice Age. 237 Community Members have visited.